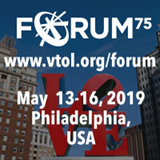 The Vertical Flight Society's 75th Annual Forum & Technology Display is the world's leading international technical event on vertical flight technology. This special 75th anniversary event will span four days and include over 250 technical papers on every discipline from Acoustics to Unmanned Systems, as well as dozens of invited presentations and discussions by leaders in the military, government agencies and industry. The Technology Display, running concurrent with the Forum, is the most extensive exposition of cutting-edge vertical flight technologies in the world, and also includes other technologies more broadly applicable to aerospace in general. Leading manufacturers, service providers, defense agencies, universities, and research and development organizations will showcase the very latest in vertical flight technology.